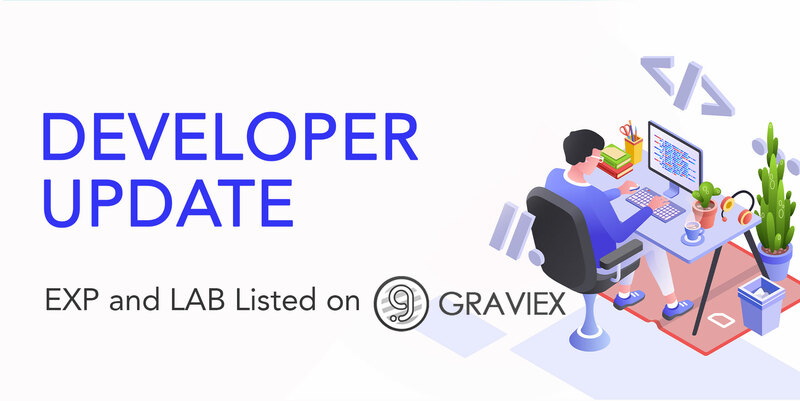 EXP and LAB Listed on Graviex Exchange. Beaxy Exchange recommitted to listing EXP, with the announcement coming next week in regard to which listing tier EXP is in. Over the next few weeks, we will launch another version of Tokenlab, incorporating the feedback from community members and Tokenlab users. The Admin Panel is almost ready to go, and Chris is working on Universal Know Your Customer (UKYC) utility. Last but not least, EXPEX is also set to launch first quarter. As some of you may know, Expanse launched a Streamcoins initiative some time ago that was extremely popular. Unfortunately, there was at least one bad actor who plotted to cheat the system and collected coins dishonestly. As a result, we had to stop the program. Now that the Know Your Customer (KYC) module of Tokenlab is complete, we can launch Streamcoins again. Participants will be forced to complete KYC before receiving their winnings, eliminating the possibility of fraud. Chris and Asim are busy setting up the process flow, and Chris has challenged us to bring ideas for rich content we can add as it’s developed. Stay tuned for updates! Hey guys! This time around we are featuring our CEO and the brains behind Expanse, Christopher Franko, in our Behind the Tech series. Chris has an A.S. in Computer Science from Beaufort County Community College, Washington, NC. He went on to pursue a higher degree from East Carolina University, but dropped out midway to start his own company. While in college, Chris was creating mobile apps, freelancing for various companies and writing automation software for affiliate marketing companies. He also used to record rap music under the name JEDISWIFT. Check out one of Chris’ creation here. Chris is a true-blue millennial who was practically raised on a healthy dose of technology, especially the Internet. He grew up sort of enamored with technology. The family got their first computer when Chris was 10, and by 13 he was learning the Perl programming language. He always felt that technology, especially the Internet, was empowering. As a millennial programmer, Internet money was a no brainer. One day when Chris was surfing through 4chan, an image-based bulletin board, he saw a thread about Bitcoin. His curiosity piqued, he researched it further, read the whitepaper and was simply blown away by the whole concept. Talking about his experience starting Expanse, Chris says that at the time he was the lead developer for a cryptocurrency called Franko, and some of the ideas he was coming up with were just too cumbersome to create with the Bitcoin scripting language. He followed Ethereum pretty closely since its inception and felt like it was a better conduit for his ideas. However, he didn’t want to be tied directly to another platform. This led him to co-found Expanse along with James Clayton and Dan Conway. The one thing that excites Chris about Expanse is its incredible community. “Nothing makes me happier than seeing our community grow.” The team has been working on a project called “We are Expanse!” a community outreach program focused on reaching people in their native languages. Our first instance of this is SomosExpanse, and work is on for a similar project for China. He says that there are so many amazing ideas that keep popping on a daily basis and sometimes ranking them by urgency is a task in itself. But he says he is happy sorting ideas on priority and losing some than not having them at all. While being positive about the future, Chris says that the current times worry him a bit. He believes that what we are seeing in the crypto space is an upheaval of sorts. With the ever-changing crypto landscape powered by regulations, legal intricacies, government policies and public perception, he feels that the churning will finally uncover businesses that provide real value to solve global problems. “Times are tough now, but it will turn around,” says Chris, as he signs off. Are you a sports fanatic looking to place a few bets on your favorite teams? Look no further. CryptoSportsBet.World provides the ultimate Internet sports betting experience — and it accepts over 45 cryptocurrencies, including Expanse. And, players using EXP will receive a 25% deposit bonus, from now through October, 19 2018. Sense the atmosphere, hear the roar of the crowd, feel the occasion – all from the comfort of your own home. CryptoSportsBet.World brings you the most competitive odds around, so not only will you be having a good time you also stand a great chance of winning some money in the process. All deposits are to be in EXP to receive bonus. All deposits in EXP will receive a 25% deposit bonus, which will be available untill the 19th of October, 2018. Players create account and deposit funds (EXP). Once funds are received and confirmed, a voucher code will be generated and emailed to email account attached to users account within 24 hrs. There will be a 100% play through on funds including bonus. i.e., if you deposit $20 worth of EXP you will receive a voucher code for $5. For you to withdraw funds from your account, it will require bets = or > than $25. So you will have to make bets up to that value and the event has to conclude. Then you will be able to withdraw your balance if you wish as long as it is over the minimum withdraw amount ($15) in the currency you desire that we accept. The Play through will start from time of confirmation of original deposit. Play through is cumulative, i.e., this is for each deposit made. They are added together and you are able to receive another bonus for depositing more EXP. Offering a unique collection of different sports, leagues and hyper competitive live betting, along with the best betting strategies anywhere, CryptoSportsBet.World is unbeatable. Gander – focus on performance and tweaking the code for maximum efficiency. Luna – New version to be released next week. Streamcoins – Developing new program and processes. Tokenlab – Finalizing KYC module to be used in Streamcoins. Tokenlab sign-up, log-in, dashboard, create token, and manage token functionality to be posted for beta testing by October 15. Chief Developer Christopher Franko and Chief Architect Asim Ashfaq have provided the following updates for various initiatives now underway. Read on to learn details about other major Expanse and Tokenlab projects in development. A timeline for the PEX airdrop is now set. As you know, EXPEX (PEX) is a fork of the decentralized exchange standard (DEX), Ox. The contracts for PEX have been launched and the Expanse decentralized exchange is in development. The new exchange will launch on the Expanse blockchain. We are finalizing the software for PEX airdrops to our Expanse and LAB token-holders, now set to commence on August 31, 2018. Watch for the promotion and build-up to the airdrop over the next six weeks. We are still looking for Ox developers. To that end, we have added 500M PEX to the EXP.Grant fund that we will use to reward the Ox developers who come on board to work on relays. Send a direct message (DM) to Christopher Franko to apply. Our Islamabad team is developing the faucet version of Expanse. This will provide the ability for our community to easily test dApps on the Expanse network. This feature, we believe, will be an excellent addition to the Expanse repertoire and a huge step forward in enhancing the usability of the network . Thanks to all who provided feedback on the new Gander Explorer during the beta test. The information submitted was very helpful, and we were able to release Gander Explorer V. 1 on July 8. You can access it at https://gander.tech. Of note, we are happy to announce that we have established the Expanse node with the DEBUG feature enabled. Through this feature, DEBUG API of the Expanse network is now accessible. This provides the ability to help DEBUG any transaction on the network. This feature is vital in helping dApp developers debug their transactions on the Expanse network and to assist them in rectifying errors or bugs in their code. The Gander is indeed the backbone of the Expanse.Tech™ network. It shows all of the transaction counts and history for a user’s account, as well as details about the miners’ activities on the Expanse network. Later on, in V. 2, we will display more great information regarding dApps and smart contracts running on the network. The development of the API documentation for Gander.tech is also underway. It will help developers integrate Expanse into their websites, mobile apps and other applications. As we announced last week, Tokenlab™ (LAB) is now listed on the BOA Exchange: HTTPS://BOAEXCHANGE.COM/MARKET/LAB_BTC. The BOA exchange has just launched, and they were anxious to have Expanse, a token with a three-year history of stability, added to their listings. With LAB, they get a utility token with unlimited growth potential and a well-established, committed team and community behind it. “BOA is a new exchange, but I’m very familiar with their dev team and trust them. It’s a good opportunity for us to grow together,” said Christopher Franko, Expanse Founder. As we reported earlier, we have an agreement with the Cryptobridge Exchange to list EXP and LAB this month. We are currently waiting for their listing manager to report back with a firm date. We will announce the date as soon as we know it. As you know, Tokenlab is about to release a series of self-service solutions to support every aspect of the ICO process. A large milestone was recently achieved when the user interface designs were approved. Developers have now started creating the html and css versions of these pages. From the backend perspective, developers have already developed APIs that will make it all extremely easy and quick to integrate, followed by a beta release. We will provide ongoing updates about the impending beta release in both this newsletter and our Discord channel. Announcements will also appear on the Tokenlab website, https://Tokenlab.io. Watch for the dedicated Tokenlab newsletter coming soon. We have successfully completed testing on MAC OSX. Currently, we are in the final stages of testing on Windows and Ubuntu. The Luna wallet beta release is set for Wednesday, July 18. Watch for it. Hello guys! This time around, we are featuring Lead Architect Asim Ashfaq in our Behind the Tech series. Asim holds a Bachelors Degree in Software Engineering from Riphah International University, a 4-year Bachelors Program. Right from his school days, Asim has always been fascinated with technology and decided to learn it more so than trying to make a career out of it. Not content with simply pursuing his education, he decided to test his knowledge and skills by taking up a part time job during his 3rd semester. After getting his degree and armed with the rich working experience he got out of more than two years working part time job for an IT company, he went on to become a Full Stack Developer and mastered the craft of working both on the backend and frontend of any technology. Asim entered the crypto sphere in early 2011. He had read about blockchain technology and its truly transformative capabilities. Amazed by the limitless possibilities this technology can afford to any sector and industry, he decided to learn more about it. Over the last seven years, he has directed his veritable skills and deep technological insights to using blockchain technology to create meaningful applications to solve real world problems. Asim is lost for words when trying to explain his initial experiences with Expanse. He started working for Expanse as a dApp developer. But Christopher saw the potential in him and offered him the huge responsibility of being the lead architect at Expanse. Asim says that Expanse is the best thing that ever happened to him professionally and this experience is getting better with every passing day. He has immense respect and gratitude for Christopher Franko for having faith in him and allowing him to establish a dedicated team for Expanse. “Christopher gave me, and continues to give me, great growth opportunities as a person and as a professional,” says Asim. Asim currently works as a lead developer and architect at Expanse and works closely with Chris as the domain expert on the various projects on the Expanse platform. He manages a team of 20 people from his office in Islamabad, Pakistan. From UI to the production release, Asim is responsible for all the tech. Asim is enthusiastic about the research department that they are in the process of establishing. This department will be tasked with exploring new avenues of applications and infrastructure that can be developed on and for Expanse. Asim is still in awe of the decentralized technologies and the infinite possibilities they hold to change the way we live. He says he has a lot to learn and much more to achieve in terms of fully appreciating what could be truly done with this technology. “Every single day is as challenging as it is exhilarating. My hunger to learn more about disruptive technologies is insatiable and this is what drives me to achieve greater things for myself and for Expanse,” says Asim, signing off. “The interesting thing about crypto is it can exist in many states at once. It can be a currency, property, a store of value, a remittance vehicle, a network.” From Christopher Franko..
“It is difficult for people to not look at the token dollar price because of the years of brainwashing that governments, banks and media have done to us. Most people who have invested in crypto hope to make some profit and then convert back to fiat so the dollar amount is important. It may take decades to fully live in a digital world, if ever….” From a very active community member. “BTC and all cryptos are so volatile that it’s impossible to use it as a daily currency. Don’t get me wrong, I can’t wait to see cryptos taking over, but it’s a bit of a utopia to think about using crypto as a currency right now.” From another devoted community member. “Hyperledger is where I’m putting most of my energy and research currently. There’s no substitute for the speed. No data limit either, but you have to come to a happy medium on that since it is coming from a database.” From a community member. In the current environment where ICOs run rampant and new projects are evolving by the minute, one of the biggest challenges for any project is the foreboding process of finding an exchange to list your token. Stability. Security. Credibility. Affordability. It really comes down to those four things. In an ideal world, it should be pretty easy to develop an exchange scorecard based on these factors. Not any more. New exchanges are popping up every day and there are lurid stories of start-up exchanges running off with the proceeds. Plus, given that exchange listing can dictate the viability of the token, and thus the project itself, most exchanges are charging a premium. In some cases, in the time that passes between notification of acceptance of your token and testing the wallet, the price has risen dramatically. Not fair, but the exchange is in the driver’s seat. It happened to us. Buyer beware. How Do Exchanges Decide Which Tokens to List? All of the characteristics you would expect come into play when exchanges evaluate a token for listing:The reputation of the project principles and the influence of investors and promoters have always been key factors. Another major consideration is volume if the token is already listed somewhere else.These common-sense factors aside, they are all meaningless if a token is not compliant with regulatory stipulations as set forth by the SEC (Securities and Exchange Commission) in the U.S. Exchanges are now routinely audited to ensure that their listed tokens pass the Howie test. Most exchanges are only interested in listing utility tokens. We won’t go into detail about regulatory compliance here, since there are volumes of articles and references provided by experts available to guide you. Tokenlab (LAB) and Expanse (EXP) are now listed on BOA Exchange. In addition to all of the selection criteria outlined above, we credit this development to persistence, patience and a little bit of luck. And sometimes it just comes down to who you know. In our last newsletter, we wrote about the EXP.Grants program and how to go about applying for a grant for your project. Well, we have our first grant recipient who successfully secured the first funds from our EXP.Grants program. His name is Denis Yurash and he hails from the Ukraine. Denis applied for the grants program for a platform, a mobile Android app, he wants to launch on the Expanse blockchain. It is called the Expanse Faucet. Denis and his team envisage their app, Expanse Faucet, as the binding link between all the community members of Expanse. In his opinion, and we tend to agree with it, with this app, more and more users will be attracted to Expanse. Every new user needs to have an Expanse address to get paid, so as more users use the app, more new wallets will be created and more transactions will be done through it. The app will also facilitate transactions occurring over the Expanse platform, especially the distribution of EXP tokens for various activities. For example, for viewing one ad, admins get $0.01, and the user gets $0.009 (in EXP tokens). All payouts will be on Expanse, so we need to convert fiat to Expanse. Then a bot buys the right amount of coins on the exchange to pay everyone using the Poloniex or Bittrex API, accordingly, and sends this back to the user’s Expanse address. The main function of Expanse Faucet is to view ads, and the second function is to complete tasks. Admins can add new tasks or change old one as they proceed. Later, a Twitter widget can be added for likes\retweet tasks, reddit upvotes, exchange votes, etc. And, depending on the future need, new tasks can be added. For example, Scotti, our Community Manager, wants to publish the latest Newsletter with some interesting info, he can simply add a new Task – «Like and Retweet Newsletter» with the link to it and send notifications to all users. This will increase the reach of the newsletter amongst the audience. Once the app is ready, Denis and his team will promote it to help bring more users into the Expanse community. Denis was thrilled to accept the very first EXP.Grant that will enable he and his team, ecorp, to create the app they have envisioned. “I have been a community member, supporter and frequent contributor to Expanse for some time now. Now, with this grant, I am being given the opportunity to actually work on an Expanse blockchain project. For that I am truly grateful. Thank you, Expanse,” said Denis. We, at Expanse, congratulate Denis and his team for securing the funds through a successful Grants application, and we wish them all the very best as they embark on the journey of creating a platform that will help make Expanse more accessible to an even broader user base. Check out the new Tokenlab website that went live today, www.tokenlab.io. This is the first iteration of the website that will host the new Tokenlab self-service ICO platform currently in development. Click through the site to learn about all of the solutions we are creating to make running your own ICO your way possible. We understand the ICO process and its challenges and have created use cases for all of the necessary functions. Our developers are well down the coding path, and we will begin to release the individual components soon. We will be adding content to the website along the way, including FAQs, information about licensing our software, and more. Watch for more announcements to follow, including the announcement of our new Tokenlab newsletter coming soon. Join our Discord channel to stay up to date on our progress. Our development team in Islamabad, Pakistan has recently moved into new office space, having outgrown the former facility. This office is the home base of our Architect and Senior Developer, Asim Ashfaq, who, along with his amazing team, creates magic for Expanse and its various platforms. The office is situated in the business district of Islamabad and comes loaded with all the important amenities designed to maximize productivity. There is a large open workspace with workstations and a separate meeting room where Asim brainstorms ideas with his team. When Asim started working with Expanse almost 18 months ago, they were a team of four. Today, the team is 19-strong, all eager to learn new technologies and working as a well-oiled machine to accomplish common goals. To keep the team motivated and hungry to achieve more, incentives such as the Employee of the Month award is given to one outstanding team member. The office also has a recreation area that has a Playstation to play games and will soon have table tennis and snooker tables so that team members can chill out and take a much-needed break from work to recharge and refresh themselves. Asim also believes that a well-appointed office will play a crucial role in attracting outstanding talent. This will help the team to grow exponentially. A presentable office space also creates a good first impression. Asim is particularly fond of Gander, as he believes that it, being an explorer, is the backbone of the Expanse cryptocurrency, the EXP tokens. Asim sees a great future for Expanse. As someone who has been as deeply involved in the development of Expanse as Asim is, he is excited and confident of the limitless possibilities that Expanse, as a platform to create awe-inspiring enterprises, affords the crypto community. Asim says that he and his team are privileged to be working with stalwarts like Christopher Franko and thanks him for this opportunity to be associated with Expanse where everyday is a learning experience. He thanks Christopher for making him part of his grand vision, which he and his team live by everyday. Hey guys! Welcome to the next article in our Behind the Tech series. This time we are featuring the story of our Chief Administrative Officer, Marcia Lewis (Danzeisen). Hope you all enjoy it and maybe take some inspiration from it. Marcia has been with Expanse from the very beginning. She met Expanse Founder Christopher Franko in 2013 while working as Chief Marketing & Strategy Officer for a blockchain technology start-up. She immediately formed a genuine rapport with him and describes him as an inspiration to her. Later after Expanse was born, she helped out when Christopher needed press releases, help with the newsletter or any other type of communications. A year ago, Marcia accepted the position of Chief Communications Officer at one of the largest banks in the U.S. She let Christopher know that it was going to be too demanding for her to help him out any more. But soon after she started that position, Christopher called and made her an offer she could not refuse. Marcia left her job at the bank that day and has been with Expanse full-time ever since. An award winning marketer, Marcia’s background is in more traditional marketing, with large teams and huge multi-million dollar budgets, for large, conservative corporations. For her, transitioning first to crypto and then to a smaller organization like Expanse, was like a foray into the wild, wild west. Everything is digital now, budgets are minimal and staff resources are much leaner. She has had to transition from being a leader to being a leader and a doer. She found out that her hands-on skills were rusty. “Fortunately, I am surrounded by technology experts who have been very patient with me and willing to take on tasks that are simply not a part of my repertoire. I am very self-actualized, and when I know I need help, I ask for it,” she says. As Chief Administrative Officer, Marcia is responsible for public relations and communications oversight. She acts as the liaison to the organization’s corporate attorneys and is responsible for patents and trademarks. She onboards new staff and prepares contracts for partnerships. Recently, she has become more involved in product development and relationship management for exchanges. She works directly with prospective clients and partners to help build enduring relationships. She regards leading the team responsible for renaming and rebranding a $9B Fortune 500 company across 90 countries and 55,000 employees as her greatest achievement to date, where she literally travelled around the world to accomplish the goal. However, she is quick to state her future greatest accomplishment goal is to get LAB onto major exchanges and launch the new Tokenlab™ platform with great success. Christopher Franko, CEO of Expanse, has no doubts about Marcia achieving the goals she has set for Expanse. “I’ve known Marcia for many years and I’ve always known her as a go-getter. She has this uncanny knack of knowing how to get things done. I admire her work ethic tremendously, and Expanse is incredibly lucky to have her on board because she brings a range of skills and experience this team really benefits from,” says Christopher. Marcia is extremely enthusiastic and positive about the future of cryptocurrencies and blockchain technology in particular. She agrees with the experts’ predictions that by 2030, 15 to 20% of all global financial transactions will use Bitcoin or or other cryptocurrencies. “In my opinion, anyone who still thinks Bitcoin is an interesting anomaly is dead wrong. I still believe that cryptocurrencies are the one investment class where a relatively small purchase could literally make you a millionaire,” she says. As you know, we are in the process of developing the software for airdrops to our Expanse and LAB token holders. The first token to airdrop will EXPEX (PEX). Christopher Franko, Expanse Founder and Chief Developer, created PEX, which is a fork of the decentralized exchange standard (DEX), Ox. The contracts for PEX have been launched and the Expanse decentralized exchange is in development. The new exchange will launch on the Expanse blockchain. We are looking for Ox developers. To that end, we have added 500M PEX to the EXP.Grant fund that we will use to reward the Ox developers who come on board to work on relays. Send a private message to Christopher Franko on Discord is you are interested in participating. Watch for more information about airdrops in upcoming newsletters. The first one is from a member of the Spanish Discord Community, which you might have gathered is a passionate bunch of people. He says, “Que bueno la Quiniela me ha quitado el stress del bajón de las cryptos.” which means that the good thing about ExpWorldCup is that it reduces the stress of this crypto dump. Here are two fun quotes from our General channel. One community member had this to say, “I came here thinking this was a discord for the TV series The Expanse.” Well, all we can say that this Expanse is grander than the one on TV! Another member says, “PM me if ur into Christian Sidehugs.” No responses to this one that we know of. Unless you are new to cryptocurrency chances are you have probably heard of the term ” ERC20 Token” and today, you are going to learn what that means and how to launch one on the Expanse network! So lets get started. ERC20 is a software standard or set of guidelines for creating tokens. But why do we need a token standard? To make it easier for companies to build software that easily integrates. Imagine for a second there were no standard.. Every new token would take a new set of rules which means increased cost and resource to integrate. In other words it would be a huge nightmare. ERC20 solves that. In this article you will learn..
What an ERC20 token is. Now that you understand what an ERC20 is, lets launch your first one! Download the code for this how to launch your own erc20 token tutorial. Every action on the Expanse network cost “gas”, gas is basically the fee we pay for computational steps. Because you are launching an Expanse contract you will need enough gas to cover this. 2 EXP is more than enough and if you join the discord.me/expanse chat and ask nicely im sure someone will help you out! Tell them Christopher sent you. From this tab you’ll notice a few buttons. “Deploy New Contract” “Watch Contract” “Watch Token”. You will be clicking “Deploy new contract”. Later we will talk about the other two. Download ERC 20 code here. After clicking “Deploy contract you will be taken to this view. Scroll down and you will see a textarea that says “solidity contract source code”. To get the source code you need for your token you can go to ERC20 Source Code . Select all (ctrl+a or cmd+a), then copy (ctrl+c or cmd+c), then paste the source into the text area (ctrl+v or cmd+v). To change the parameters of your token you will go to line 100 and look for the “constructor function”. Remember the Contracts tab we visited earlier? The one where you clicked “deploy contract” well that is where your token contract will show up once you deploy it. Step 10: Friends can add your token to their wallet. All your friends need to do to add your token to their wallet is your token contract address and to click “watch token” on the “contracts” tab in the Expanse wallet. And thats it! With power comes great responsibility so use your new super powers wisely. Share your tokens in our discord channel. “Crowdfunding” has gained quite a bit of momentum with the arrival and popularization of cryptocurrencies and blockchain technology. Hundreds of companies in the blockchain space have raised billions of dollars using crowdfunding in the last year and a half. In the simplest terms, crowdfunding means collecting funds for a business from the crowd, the general public. members of the crowd contribute small amounts so as not too much of a burden on anyone. Pooled together, it can become a reasonably large sum for the business. Crowdfunding may be donation-based (participants expect nothing in return for their donations), reward-based (some rewards are expected in return for contribution), or equity-based (ventures offer a share in the business equity against contribution). There are certain conditions that have to be met in order to invest in a reward-based or equity-based crowdfunding campaign, and for the exchange of value to take place in a fair manner for all the parties involved. Blockchain offers a perfectly automated platform that is ideal for crowdfunding, as smart contracts can be formulated with pre-defined conditions for the contributors as well as those seeking contribution. These contracts can be executed to issue either rewards or proof of equity to those who contribute to a venture. Cryptocurrency combined with blockchain technology can actually be a great channel to connect those who have small amount of spare money and want to invest it but don’t want to deal with the complexities that come with investing in a business, with those who have some fantastic business ideas but don’t have enough money to fund those ideas. Since more than half the population of the world has an internet connection, billions of people are connected and know about things happening all around the globe in real time. It is well known that small and medium businesses all around the world need more funds. Crowdfunding as a source of business funding is becoming increasingly popular and with the help of social media, it is easier than ever to circulate innovative ideas and attract investors. And since cryptocurrency is literally borderless, your business idea can get funded by people from any part of the world, provided there is mutual trust and consent. Trust comes embedded with blockchain, since no one can hack or freeze your crypto wallet or steal your crypto identity. If you have an awesome business idea, or own a small startup that you want to expand, you can make use of blockchain technology to fund your business by creating digital tokens on a blockchain that allow you to pre-sell your products/services or grant equity in the business to the buyers of these tokens. Popular as ICO or Initial Coin Offering, the mechanism of raising funds with the help of crypto tokens on blockchain allows entrepreneurs to connect with resources that are secure and give them the much needed financial muscle, minus the inefficiency of traditional financial institutions. These crypto tokens can be purchased against cryptocurrencies, and can be traded on cryptocurrency exchanges. So in essence, an ICO is as good as shares and securities that the traditional stock market deals in. An ICO is the way for entrepreneurs to leverage blockchain technology to gain access to resources freely, without involving a third party, along with additional benefits of security and flexibility. There is some regulatory compliance involved and technical expertise required for this purpose, but you don’t have to worry at all, since Tokenlab is here to help you! You need not be a developer or a blockchain expert who is experienced in building ICOs or coding smart contracts. With Tokenlab’s safe and easy platform, all it takes is a few clicks to start a fundraising campaign for your business idea. You can even keep track of the performance of your campaign and helps you gauge public engagement. With Tokenlab users can start a new campaign by keying in some simple information like start and end date of the campaign, target amount that they intend to raise, and price of the tokens offered. The number of tokens will depend on the price of the token and the target amount. You can run staggered campaigns, like a pre-sale and then token sale, and once your campaign is successfully completed, you can issue tokens to those who have contributed to your venture. Tokenlab has its own ERC644 token, LAB, which is the underlying token or standard token for all transactions. It is transferable and you need to burn some LAB tokens to create your own token for your campaign. Tokenlab is a utility exclusively meant to make the ICO creation process simple, safe and secure for entrepreneurs. It allows users to create assets on the Expanse blockchain platform. Tokenlab is here to revolutionize the way business is done and to bring true democracy in equity investment, making it simple for entrepreneurs to raise funds for their business while also allowing them to create their own tokens, having complete control of their venture. Welcome to the first edition of the Expanse Newsletter for 2018. This publication is a bi-monthly newsletter issued on the 1st and 15th of each month to share happenings within our community. Keep in mind that breaking news can come at any time, but the Expanse Newsletter is a great overview of progress, news, and our current focus. The main announcement for this Newsletter is that CryptoBridge DEX has agreed to list Tokenlab™ (LAB) on their exchange in February. This is huge news for those of us who have been waiting. The agreement also specifies that they will list Expanse (EXP), as well as future tokens launched on the Tokenlab ICO platform. In return, we will help them gain more attention and popularity with our large community of traders and investors that follow Expanse. As soon as we have the exact date in February from CryptoBridge, we will share it with you all, but it is officially on the way. We will also continue reaching out to centralized exchanges to add Tokenlab, but currently, most are just overwhelmed with demand. That is another reason a scalable decentralized exchange like CryptoBridge has real potential. There is growing demand for a solution like this. Fact is, scalable decentralized exchanges are the future, and this new partnership is a big step in that direction for Expanse and Tokenlab. In other news, we have also signed a deal with Locopixel to have them assist with some development work. Locopixel is a company of approximately 50 developers. Chris and the Expanse dev team occasionally need help with various work that takes a great deal of time, so Locopixel is being brought on board to assist. We have already run a test project with them to see how they would perform, and they excelled, delivering the test project as needed, on time, and correctly. So we are expanding the relationship beyond just testing and trials to actually bringing them on board to help with various work that we can outsource to them. This is simply to streamline and speed up the development of the Expanse project in a very time-efficient and cost-effective manner. So this is great news that will help Expanse scale and grow with demand, as development needs naturally become greater over time as Expanse grows. Dropd will be a music platform unlike any other in existence today—a place where people of all ages and countries go to listen to their favorite artists, discover new artists and connect with each other. The platform is the place where good music, whether from a famous artist or a complete unknown, can rise to the top and be monetized instantly. All users will be able to participate in the success of artists with the market determining who is popular, not huge corporations. By the time this project is complete, the music industry will be changed forever. Vin Foresta, founder and CEO of IJI, Inc. and Dropd architect/developer, describes that his vision “will include all these things and much more. Dropd will be orders of magnitude greater than an ordinary music app; it will be revolutionary. By the time this project is complete, the music industry will be changed forever,” he said. Dropd’s patent-pending technology uses the blockchain to decentralize an antiquated business model. The music industry is perhaps one of the best examples of an industry that stands to be drastically altered by blockchain technology. The decentralization and socialization of the music industry have the potential to create the opportunity of a lifetime for many, as well as massive disruption to the status quo. Dropd is positioning itself as the driving force that will lead music into the blockchain age. Given the evolving regulatory environment in the U.S., Dropd’s ICO will exclude U.S. citizens’ participation. The technology for the Dropd ICO site will have IP blocking in place for US residents and a secondary check that forces users to declare they are not a resident of the U.S. The ICO countdown will begin soon. Watch for a definitive timeline to be published later this week. Dropd is a platform that is well into the development cycle. It is not just a concept; it is a viable technology with public launch projected in the third quarter of 2018. Watch for the promotional buildup and ICO site listings to begin over the next few weeks. The Expanse and Tokenlab teams could not be more excited about the Dropd project! QuikNode is in the process for setting up easy to set up and scale Expanse Nodes. This will make it much easier to deploy Expanse nodes. The more nodes, the more of a decentralized Expanse. So a big thanks to QuikNode for helping out Expanse. Welcome to the twenty-second edition of the Expanse Newsletter for 2017. This publication is a bi-monthly newsletter issued on the 1st and 15th of each month to share happenings within our community. Keep in mind that breaking news can come at any time, but the Expanse Newsletter is a great overview of progress, news, and our current focus. We are excited to announce the final Tokenlab Sale begins today! This will be the last chance to get Tokenlab before it is traded live on exchanges. Exchange trading will also begin shortly after the sale ends, so make sure and check out the project while there is still time to get in at a set price. Tokenlab has a maximum market cap of only 10 million USD, and if anything is unsold it will be burned (destroyed) and rarer. A common problem with many recent ICOs is that they have their ICO sales and then fail to launch on any major exchanges, leaving traders holding and wondering about the viability of what they bought. This will not be a problem for Tokenlab. We have already planned to launch Tokenlab (LAB) on one of the top cryptocurrency exchanges, HitBTC, and we are also reaching out to other prominent exchanges to list Tokenlab. This means the Tokenlab sale is much safer than other ICO projects that have not planned ahead for speculative trading that is essential for the long-term success of any project. The exact timing of the launch on exchanges, of course, will depend on various exchanges and how long they take to implement, but this is something that we are very aware of and on top of. We are also in negotiations to see about getting Expanse added at the same time. If you have not already signed up for HitBTC you can follow the link below and get ready in advance. This is a high volume top exchange that offers a variety of quality cryptocurrencies and tokens. Zcash has been added to the Tokenlab platform in time for the final sale. This means that not only will the Tokenlab final sale ICO accept Zcash, but all ICOs running on Tokenlab in the future will have this option. Zcash has one of the best teams in cryptocurrency with outstanding credentials and experience. Along with Zcash, of course, we accept Expanse, Ethereum, Bitcoin, Litecoin, Pivx, and Steem. Expanse is our community based decentralized version of Ethereum, Ethereum is the giant of crypto that is setting the standards for smart contract technology. Bitcoin, as you all likely know, is the oldest and most trusted cryptocurrency. While Litecoin is one of the best options for digital cash with a solid team. As for PIvx, they have a massive community, along with a unique anonymous implementation of Zerocoin, and Masternodes. Last but not least, Steem, of Steemit, is the leading crypto social media platform today. IJI, Inc. and Tokenlab are hard at work gearing up for the DPD ICO. Trade named Dropd 2.0, it is already positioning to be added to the major exchanges when the final sale closes in the new year. Dropd is a patent-pending revolutionary decentralized music platform creating an open source token (DPD) on the Expanse.tech blockchain for use in digital music transactions. Unlike any other platform in existence today, Dropd 2.0 will allow users to curate, consume and promote music while being rewarded with DPD digital tokens. Sign up for the newsletter and read the whitepaper here:www.dropd.co. The Expanse Project partnership with Guatemala-based Power Development, creators of Gameboard, is well into the process of integrating their incentive-based gamification system into the Expanse.Tech™ blockchain platform. Gameboard, a gamification system already in production, is an online platform that allows the tracking of an individual’s gaming actions—measuring and comparing each member, team or department—using a rewards system to award points and badges at various levels. Omar Alvarez, Power Development CEO and Founder, describes Gameboard as a gamification playground that uses rewards to incent players, with built-in recognition and reporting capabilities. It can be used in many types of disciplines, such as marketing, education, and psychology, for behavior modification. The rewards earned are incentive to play on the gamification playground already accessible at thewww.gameboard.site. The Praetorian Group is focused on creating a token, (PAX), on the Tokenlab platform. It will be backed by real and tangible assets, to help revitalize blighted communities in New York State. PAX provides the opportunity for those who participate in the ICO to own a percentage of the New York real estate market. The only token backed by sound money and filed with the Securities Exchange Commission, the PAX FCC filing is complete. The idea of infusing new money into depressed housing areas through the trust and transparency of blockchain technology is a tokenization utility that the Praetorian Group is thrilled to bring to life using Tokenlab. Go towww.praetoriangroup.io to read more about the exciting developments underway. CHCK-N Bar brings a new level of social media marketing to the blockchain using the Tokenlab platform. Check-In Bar has partnered with scores of internationally known liquor brands and venues to reward consumers with free drinks in exchange for their selfies. Check-In was launched with the intention of changing how liquor brands react with guests. By providing ICO management services for Check-In Bar, Tokenlab becomes a vehicle that helps enable their creation of a technological marketplace for the most demanded currency of the new age—emotions. It’s a downloadable app that allows users to pick a bar, open the app, and choose a drink from the app’s menu. The app then launches a camera with the brand’s filter already embedded. Consumers can snap a selfie, share it on Facebook, and enjoy a free drink. Among Check-In Bar’s partners are Bacardi, Jameson, Jack Daniels, Red Bull and Jagermeister—just to name a few. Go tohttp://www.chck-n.com/ to stay abreast of current developments.